I recently threw my daughter a birthday party that involved a lot of paint, some decorate-them-yourself cupcakes, and a house full of busy, happy children. It was a lot of fun and generally went a lot smoother than I expected. I typically don't buy disposable dishes, but I did buy some for this party. In particular, I purchased some Dixie cups to put the frosting in to make the cupcake decorating less of a free-for-all of licked spoons being dipped into a communal tub of sugar. While I was getting the supplies out for the day, I noticed something interesting on the side of the box of Dixie cups. 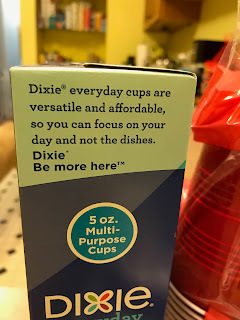 It says, "Dixie everyday cups are versatile and affordable, so you can focus on your day and not the dishes. I was curious, so I looked into the campaign and found a few commercials with the same slogan. The entire campaign centers on the idea that dishes are distracting us from the more important things in life. We are implored to "be more here" by engaging in conversations and family experiences rather than dishes. I take issue with this on several different levels. First, let me be clear. I hate doing dishes. I am not here to defend doing the dishes. It's a miserable, endless, thankless task that I did tonight, and yet magically when I go downstairs in the morning, the sink will be full of dirty dishes. This despite the fact that all the people who use the dishes will have been asleep upstairs all night. It's a mystery. I can't explain it. Anyway, even though I really hate doing the dishes, I still don't feel the need to be pressured into a constant supply of disposable products to avoid them. For one, someone still has to wash all those serving bowls and utensils and cookware that produced the food on those plates, right? The dishes are a-callin'. Secondly, even though the campaigns don't overtly gender the would-be dish-doer, I think it's pretty clear that this is tapping into mom guilt. You already waste so many of your precious moments away from your children. Are you really going to miss out on the chance to help with homework just so you can wash that plate? Well, are you, Susan? And whose fault will it be when little Timmy gets a C? Finally, this campaign suggests that being "here" (a call upon the general trend toward mindfulness in our lives and specifically in consumer practices) is a wholly individual, self-centered thing. My being "here," according to Dixie, means in my own home, focused on my what is right in front of me. 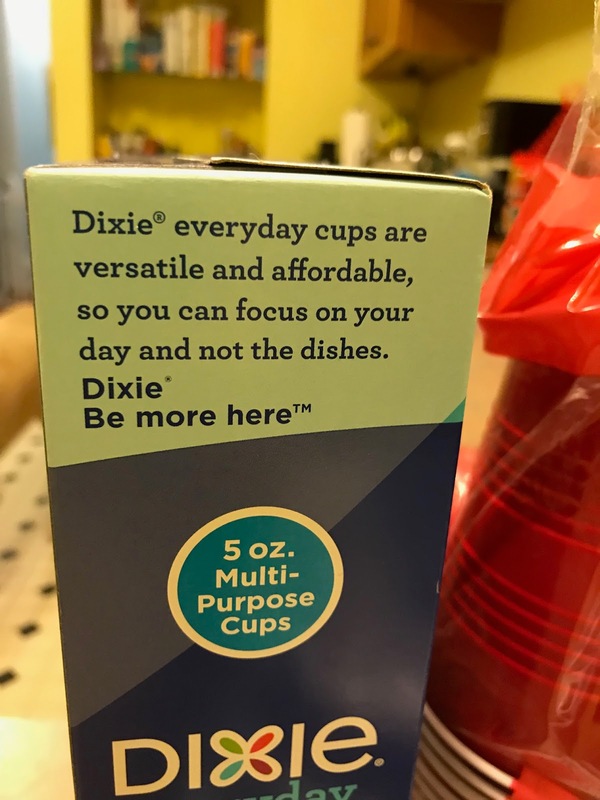 But the drive to use fewer disposable products (the drive I am sure Dixie is reacting against with this campaign) is also about being "here." They just define the "here" in a broader, more collectively impactful way. 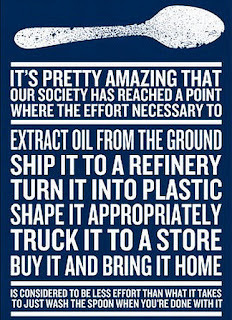 People who refuse to buy more than they need do so often with an eye toward reducing the negative impacts of consumerism, particularly on the planet. They are "here," too. Dixie's attempt to make doing your own dishes a source of guilt over missing out over life's better moments is shameful. 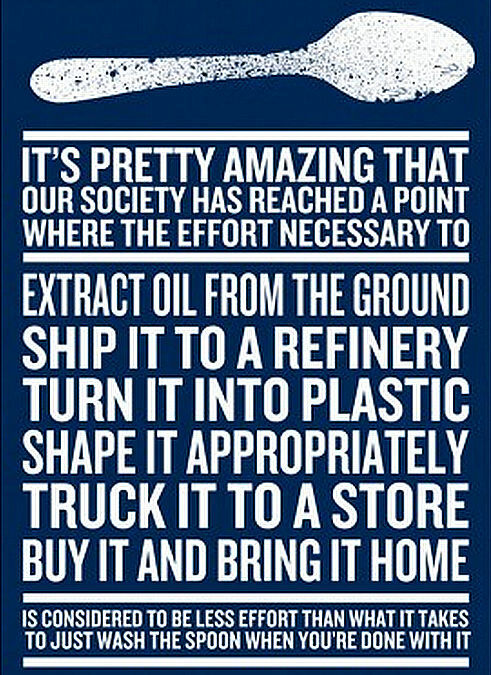 I understand that this might be a challenging time, ethically, to sell disposable products, but this kind of doublespeak about the motivations behind efforts to consume less isn't helping.